Super-Team Family: The Lost Issues! 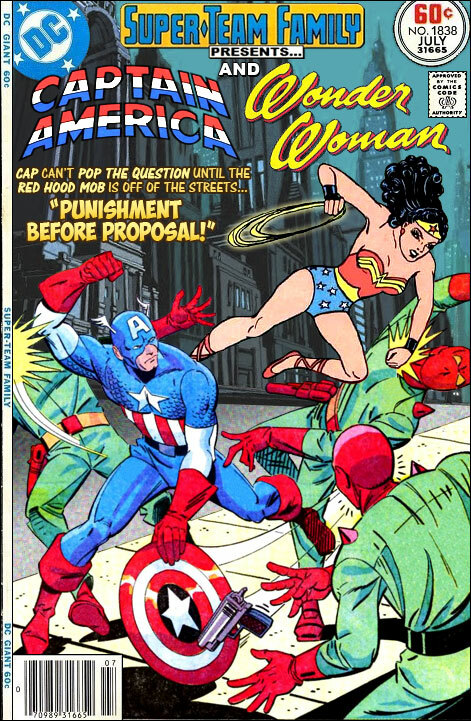 : Captain America and Wonder Woman in " Punishment Before Proposal!" Captain America and Wonder Woman in " Punishment Before Proposal!" I am glad that like Captain America's film debut, Wonder Woman's first solo outing will be a period piece. It adds to the mythic feel of the characters while also paying homage to their comic book history. Plus, anything to help set a film apart from the many other comic book blockbusters out there is a good thing. Reading the issue's title before scrolling down to look at the cover, and knowing what I do about Wonder Woman's history... I expected to see one or the other of that couple being tied-up by the other! They already have on a previous WW/Cap cover. *Btw: in case you hadn't yet seen them for yourself? The previews for the Wonder-Gal movie seem to have her fighting Germany during WWI. Yes they choose to use WWI in movie I think to differentiate between Captain America and Wonder Woman I think. This cover seems out of order - they were getting married in previous episode. My WW/Cap covers jump around in continuity. Steve Ditko Capt America? The red hoodlums look Ditko-ish, but Cap... just looks like Cap. Wonder when/where that's from. Always fun to see the different era-styles you use. Like WW here. Truly old-school. @Glenn Host: So, if DC and Marvel ever _did_ make a movie teaming these two, WW would be like a cougar? While the Wonder Woman on the cover honors the Golden Age, she actually appeared in the 80's! Trina Robbins drew her for THE LEGEND OF WONDER WOMAN, which bridged Volume 1 with the Perez-drawn reboot. Much as I hate to admit it? I have to agree with the 2nd Anonymous on this one. Kang Vs. The Seven Soldiers of Victory!